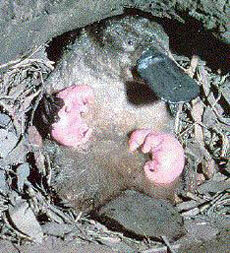 Monotremes: At top, a mother platypus cares for her immature young. The babies are not fully formed when they hatch  lacking hair, claws, and a sense of sight. At the bottom is one of the two living species of echidna, shown digging for earthworms that make up most of its diet. The modern platypus is distributed among the freshwater systems of eastern Australia where it occurs in abundance, though its range does appear to have been rather reduced since the 19th century. 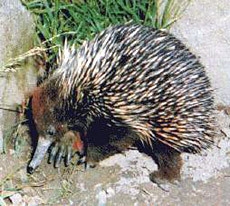 Of the echidnas, Tachyglossus has the greater range, occurring in eastern Australia, as well as New Guinea and Tasmania. Zaglossus is apparently restricted to New Guinea. The single feature of monotremes that, perhaps more than any other, causes them to stand out among them mammals is that monotremes lay eggs rather than giving birth to their young. In echidnas, the egg is carried in a pouch on the female's belly until the young hatches, at which point the barely-developed young must find a mammary gland and latch onto it for nourishment. In the platypus, the female retires to a burrow in the bank of a river or pond. The burrow is lined with dry vegetation, and there the eggs are laid. Little is known about how platys care for their young because the burrow ould need to be excavated without disturbing the mother. Long-nosed echidnas (Zaglossus) feed primarily on earthworms, and possibly scarab larvae as well. Short-nosed echidnas (Tachyglossus) feed mostly on ants and termites. These are lapped up by a long slender tongue that may extend as much as 18 cm from the snout. The tongue and the roof of the mouth are covered by spines that are used to grind open the insect skeletons. By contrast, a platypus finds most of its food underwater, using its sensitive snout to hunt. Its prey may include insects and their larvae, bivalves, gastropods, freshwater crustaceans, and the like. These are stored in the cheek pouches and will be chewed after returning to the surface. 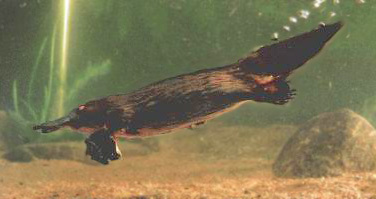 Underwater prowler: A platypus hunts for food underwater, using a highly sensitive snout to find prey, then storing it in cheek pouches until the return to the surface. Like the echidna, an adult platypus has no teeth. A young platypus will have teeth, but these are lost as it matures. However, the adult will produce a hardened set of pads in its jaws for chewing. The platypus is unusual among mammals in other ways as well; it is one of only a few mammals that are venomous. The males have a venom spur on the heels of their hindlegs, used in premating combat for rights to the females. While not strong enough to be fatal to humans, platypus venom can inflict serious pain in the incautious and has been known to cause fatality in dogs. Effects may include hyperventilation, hypoxia, and convulsions. Echidnas also have spurred heels, but these appear to be a feature of both sexes in the young, the females losing them as they mature. Visit the University of Michigan's Animal Diversity Web for more information about living monotremes.